March 25, 2013 | David S. Maldow, Esq. Greetings from Orlando and the 2013 Enterprise Connect conference. If you recall, this is the conference formerly known as VoiceCon - where there were so many exhibitors fixated on video that they had to change the name. 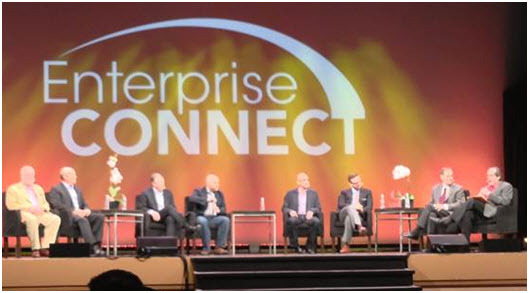 Enterprise Connect 2013 was a blast. It may not be the biggest tech show on the planet, but it is by far the largest and most successful event focused specifically on visual collaboration, and it is growing every year. This year's show was a massive success, with standing room only (time for a bigger venue?) 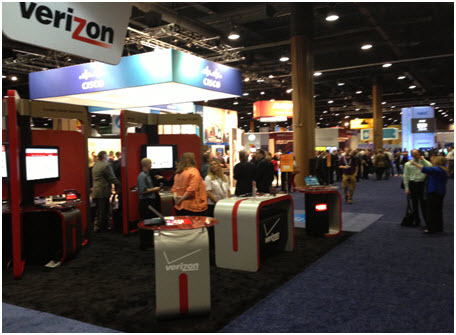 for several of the conference sessions and great activity on the showroom floor. As fans of visual collaboration technology we can't help but give a "thumbs up" of approval for things that we like, but we also must give the eye-roll of disapproval when we think things are off the mark. Let's start by discussing some general themes and trends we saw at the show. It can be fun to follow the advice of pop star Prince and Party Like It's 1999, but in technology we generally like to move forward rather than backward. This year's conference has totally shocked a quite a few of us in the industry because of the prevalence of so many things that are throwbacks to the past. The topic of interoperability came up over and over again at this year's conference. After all, what hasn't been said about UC at this point? The concept is not that complicated. It is ridiculous that we have dozens of apps on our devices, (often including multiple VC apps, email, text, phone, etc.) each with its own incomplete contact list. The current workflow is completely backwards as we first must choose HOW we want to talk to someone, and then we can select WHO we want to talk to. UC just reverses that workflow by making one master contact list that controls everything. Select the person you want to talk to in the master list, and depending on their availability, choose whether you want to do video, audio, text, etc. It isn't rocket science, and it is a much more natural and intuitive way for people to manage their communications than the current paradigm. So why is it still not here? The opening general session was titled - "Is UC Moving Toward a New Plateau or Towards a Cliff." It was well attended and more interesting than expected. There was lots of lively discussion, and a number of notable moments. One of them was when the GM of Lync Marketing at Microsoft was directly asked about interoperability and responded with details of Lync's impressive adoption and federation in the last year. The fact that thousands of Lync users can talk to each other without any interoperability issues is not the answer the audience was really looking for. It was one of those Prince moments, back to the 1990s when Microsoft effectively solved OS compatibility problems by getting the entire world to use Windows. There is something to be said for creating a standard, but there is also something to be said for partnerships. Another moment was when Cisco's new GM of their Collaboration Technology group, Rowan Trollope, directly called-out Microsoft Lync as "operating behind a walled garden" and "not believing in an open system" to break-down barriers to adoption. To be fair, Lync actually is doing a lot of things right when it comes to partnerships, and should be getting a thumbs up for it. Microsoft appears to be working with everyone on Lync integration (or at least allowing everyone to work on their own integrations). Vendors of all shapes and sizes were demoing Lync integration at various stages throughout the exhibit hall. It was to the point where attendees were joking that Lync integration must be an exhibitor requirement, and that next year the coffee machines will be Lync enabled. All of the panelists at that session generally agreed that UC and collaboration is growing exponentially and will see a "huge rise" this year, despite the fact that the competing visions of collaboration permeated the event. We attended a number of sessions discussing the coming WebRTC nirvana. It is clearly this year's harbinger of interoperability (just as SIP was a few years ago.) In fact, the conversations in sessions and on the floor about how WebRTC will be our "savior" could just as easily been said at Telecon conference in the 90's, substituting H.323 or IP as the buzzwords. Once again, we were humming the old Prince song. On the first day of the event a "conference within a conference" took place on the topic of WebRTC. Many were surprised about how well attended it was. Certainly the organizers were surprised as the room that was set aside to hold the event was about half as big as needed and needed to be expanded about 30 minutes in. It really shouldn't have been such a surprise considering it was one of just a few sessions on the calendar and took place before the exhibit floor opened. Furthermore, this is a hot topic and attendees wanted to be informed, despite a significant amount of skepticism as to whether it will amount to much soon. While we roll our eyes at the idea of another magic fix to all our problems, WebRTC does get a thumbs up for its very real benefits, in particular its potential accessibility. To paraphrase Scott Wharton, CEO of Vidtel, one of the key differences with WebRTC and previous "magic fixes" is that there is no question of whether it will be deployed to the masses. 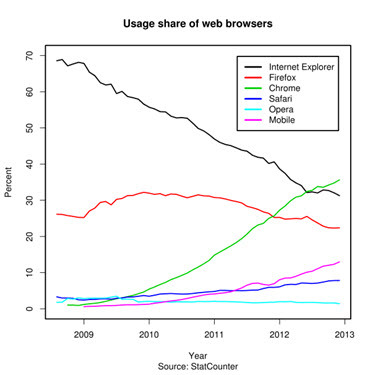 Everyone has a browser and it will be an inherent part of all browsers in the near future. If the other browsers catch up, it will be the only 100% ubiquitously deployed VC technology, allowing every internet user on the planet to instantly join a call with no plug in or configuration. That gets a big thumbs up. However, universal accessibility is not the same thing as interoperability. One of the conference attendees quipped "why do I really care if I eliminate one browser add-on download but instead need to download new browser?" WebRTC - if it becomes ubiquitous - is an extremely compelling answer to the "guest invite" question. Ideally, we don't want to join meetings as guests, we want to join using our own collaboration solution of choice - and that requires interoperability. If we have to leave our choice to join a meeting as a WebRTC "Guest" it is clearly not ideal. That is the difference between accessibility and interoperability. The skepticism comes from the fact that in order for WebRTC to fulfill all of its promise, of a whole bunch of firms who don't agree on very much of anything would suddenly have to hold hands and sing Kumbaya. Most realize that likely will not happen soon. In fact, on the "Leveraging WebRTC for Video Conferencing Panel" Both Vidyo's Ofer Shapiro and Polycom's Stuart Monks admitted that their firms will still use proprietary software on their clients for "a considerable time" past the release of WebRTC - and no one blinked. Our industry has to "look itself in the mirror" and finally conclude that if the suppliers truly supported interoperability we would have had it by now. After spending about six years exalting Immersive Telepresence - with its life-size, high-definition video and enveloping total experience, a number of very large exhibitors and providers now feel that you can duct-tape a webcam to a wall and call it "Boardroom Videoconferencing." In fact, that's just what Microsoft did in their booth - showing a mock "Boardroom" with the webcam jammed between two displays, which garnered literal, as well as figurative eye-rolls. A favorite tweet of the show was when someone saw this in action and said "It's CU-See Me all over again." That being said, the problem is not the product, but the presentation. For small meeting rooms, huddle rooms, and SMBs on a budget, this new Logitech webcam could be the magic bullet they are waiting for. With a wider field of view than a typical webcam, it is designed to provide a great view of a meeting room table. Wrap this up with an affordable cloud service and you have a low cost, easy entry, viable small room solution, with a greatly improved experience compared to huddling around a laptop with a typical webcam. Change the marketing on this concept from "Boardroom" to "Efficiency Small Team Room" and our eye-roll quickly changes to a thumbs up. While this example is from a booth, the trend of discounting the value of the immersive experience, despite common knowledge of its benefits when used appropriately, was common throughout the event. 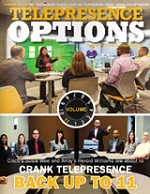 It is just proof of the concept of how a pendulum swings back - with the buzz for higher end Telepresence products now fading away we go to the other extreme with ultra-affordable implementations coming to the forefront. Let's all hope for a happy medium soon. To Rob and Cisco's credit they kept going and gave a compelling demo of how the "internet of everything" with sensors and smart devices is changing the way we live - although some uses really seemed to be solutions looking for a problem. For example, it is extremely cool that the solution can use devices buried in the parking lot to find open spaces and GPS to help you find a good one. But honestly, we don't have trouble parking at Best Buy nearly as often as we have problems due to a lack of ubiquitous visual collaboration. On the other hand, the demo did show the ability for in-store staff to quickly connect customers, face to face, with the exact right expert at each point in the sales process. That kind of future vision has powerful potential. When it was his turn on Wednesday, Microsoft's Derek Burney took the stage and woke everyone up with his shirt. (The joke of the event was that the bright colors on his shirt caused the venue's video cameras to have flare problems - red flare...white flare...silver flare...) Microsoft's demo showed Lync video actually working on an android and iOS smartphone in real time. The video was choppy and unstable, but those in the audience were excited to see it finally work after so many promises. He did say that Lync-Skype integration was not ready to show yet - that audio would probably be in June and video "sometime thereafter." It makes it very difficult to analyze and compare Lync when you always have to preface it with a debate around the analysis being based on the available product today vs. the promise of the product of tomorrow...or next week...or next month. He then showed one of the new Lync Room Systems in action. 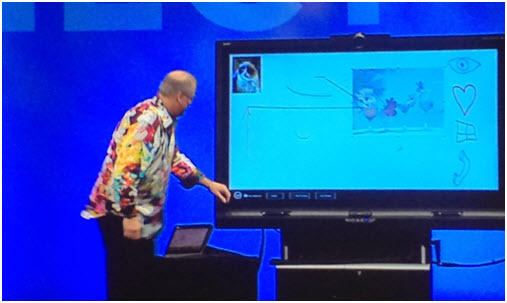 For those of us familiar with the Smart interactive whiteboards and their Bridgit server it was a very perplexing demo. 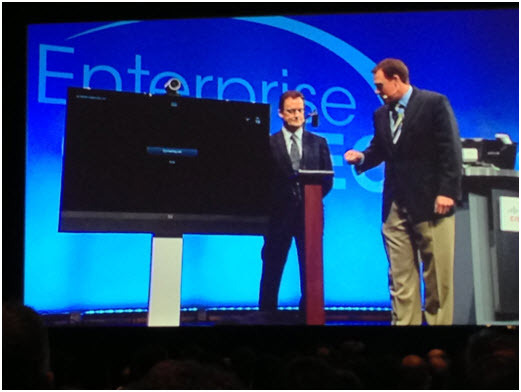 He was essentially taking an Enterprise Connect Keynote presentation to demonstrate a different firm's product - one that's been available for quite some time, yet showing it as if it was a new Microsoft solution available soon. 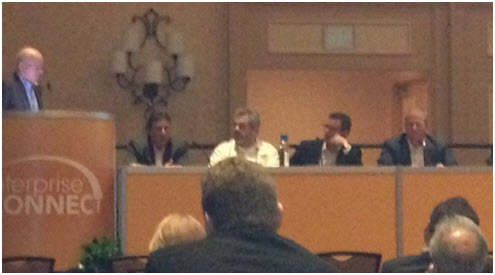 Co-author David Danto was honored to be selected as a panelist for the "Managed Video - What's Next" session. In discussing Managed Video Services David pointed out that a fundamental change is coming in the industry and in client expectations around a services partner. The model that's been in use - dating back to managing PictureTel Concorde systems on carts is log dead. Video Managed Services need to include responsibilities for the network, desktop, warranties, dynamic licenses - essentially now becoming end-to-end Collaboration Managed Services - with no "handoff to the IT guys" as we ARE the IT guys. Expect many changes in the landscape in the coming months - including new manufacturers, new collaboration modalities and new Managed Services models. This article was co-written by the authors below and contains solely their own, personal opinions. While this article covered some of the hot topics at the conference, there was also plenty to report from the Exhibition floor. Be sure to check both author's websites and blogs in the next few days for details on our respective booth crawls. 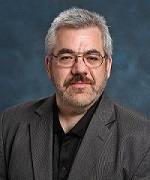 David Danto has over 30 years of experience providing problem solving leadership and innovation in media and unified communications technologies for various firms in the corporate, broadcasting and academic worlds including AT&T, Bloomberg LP, FNN, Morgan Stanley, NYU, Lehman Brothers and JP Morgan Chase. He now works with Dimension Data as their Principal Consultant for the collaboration, multimedia, video and AV disciplines. He is also the IMCCA's Director of Emerging Technology. David can be reached at [email protected] or [email protected] and his full bio and other blogs and articles can be seen at Danto.info. Please reach-out to David if you would like to discuss how he can help your organization solve problems or develop a future-proof collaboration strategy. As fans of visual collaboration technology we can't help but give a \"thumbs up\" of approval for things that we like, but we also must give the eye-roll of disapproval when we think things are off the mark. Let's start by discussing some general themes and trends we saw at the show. It can be fun to follow the advice of pop star Prince and Party Like It's 1999, but in technology we generally like to move forward rather than backward. This year's conference has totally shocked a quite a few of us in the industry because of the prevalence of so many things that are throwbacks to the past. The opening general session was titled - \"Is UC Moving Toward a New Plateau or Towards a Cliff.\" It was well attended and more interesting than expected. Another moment was when Cisco's new GM of their Collaboration Technology group, Rowan Trollope, directly called-out Microsoft Lync as \"operating behind a walled garden\" and \"not believing in an open system\" to break-down barriers to adoption. All of the panelists at that session generally agreed that UC and collaboration is growing exponentially and will see a \"huge rise\" this year, despite the fact that the competing visions of collaboration permeated the event. We attended a number of sessions discussing the coming WebRTC nirvana. It is clearly this year's harbinger of interoperability (just as SIP was a few years ago.) In fact, the conversations in sessions and on the floor about how WebRTC will be our \"savior\" could just as easily been said at Telecon conference in the 90's, substituting H.323 or IP as the buzzwords. Once again, we were humming the old Prince song. On the first day of the event a \"conference within a conference\" took place on the topic of WebRTC. Many were surprised about how well attended it was. Certainly the organizers were surprised as the room that was set aside to hold the event was about half as big as needed and needed to be expanded about 30 minutes in. It really shouldn't have been such a surprise considering it was one of just a few sessions on the calendar and took place before the exhibit floor opened. Furthermore, this is a hot topic and attendees wanted to be informed, despite a significant amount of skepticism as to whether it will amount to much soon. While we roll our eyes at the idea of another magic fix to all our problems, WebRTC does get a thumbs up for its very real benefits, in particular its potential accessibility. To paraphrase Scott Wharton, CEO of Vidtel, one of the key differences with WebRTC and previous \"magic fixes\" is that there is no question of whether it will be deployed to the masses. Everyone has a browser and it will be an inherent part of all browsers in the near future. If the other browsers catch up, it will be the only 100% ubiquitously deployed VC technology, allowing every internet user on the planet to instantly join a call with no plug in or configuration. That gets a big thumbs up. However, universal accessibility is not the same thing as interoperability. One of the conference attendees quipped \"why do I really care if I eliminate one browser add-on download but instead need to download new browser?\"
WebRTC - if it becomes ubiquitous - is an extremely compelling answer to the \"guest invite\" question. Ideally, we don't want to join meetings as guests, we want to join using our own collaboration solution of choice - and that requires interoperability. 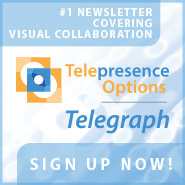 If we have to leave our choice to join a meeting as a WebRTC \"Guest\" it is clearly not ideal. That is the difference between accessibility and interoperability. The skepticism comes from the fact that in order for WebRTC to fulfill all of its promise, of a whole bunch of firms who don't agree on very much of anything would suddenly have to hold hands and sing Kumbaya. Most realize that likely will not happen soon. In fact, on the \"Leveraging WebRTC for Video Conferencing Panel\" Both Vidyo's Ofer Shapiro and Polycom's Stuart Monks admitted that their firms will still use proprietary software on their clients for \"a considerable time\" past the release of WebRTC - and no one blinked. Our industry has to \"look itself in the mirror\" and finally conclude that if the suppliers truly supported interoperability we would have had it by now. 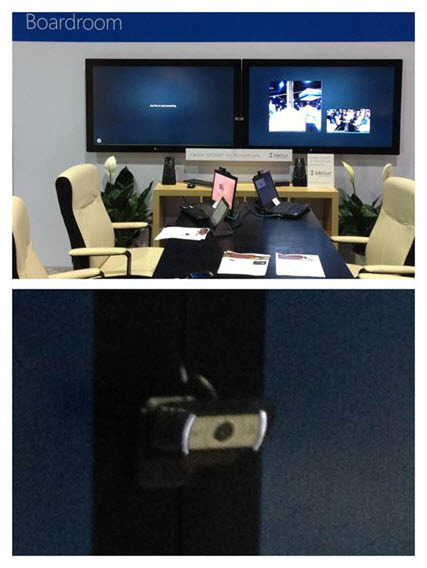 After spending about six years exalting Immersive Telepresence - with its life-size, high-definition video and enveloping total experience, a number of very large exhibitors and providers now feel that you can duct-tape a webcam to a wall and call it \"Boardroom Videoconferencing.\"
In fact, that's just what Microsoft did in their booth - showing a mock \"Boardroom\" with the webcam jammed between two displays, which garnered literal, as well as figurative eye-rolls. A favorite tweet of the show was when someone saw this in action and said \"It's CU-See Me all over again.\"
That being said, the problem is not the product, but the presentation. For small meeting rooms, huddle rooms, and SMBs on a budget, this new Logitech webcam could be the magic bullet they are waiting for. With a wider field of view than a typical webcam, it is designed to provide a great view of a meeting room table. Wrap this up with an affordable cloud service and you have a low cost, easy entry, viable small room solution, with a greatly improved experience compared to huddling around a laptop with a typical webcam. Change the marketing on this concept from \"Boardroom\" to \"Efficiency Small Team Room\" and our eye-roll quickly changes to a thumbs up. To Rob and Cisco's credit they kept going and gave a compelling demo of how the \"internet of everything\" with sensors and smart devices is changing the way we live - although some uses really seemed to be solutions looking for a problem. For example, it is extremely cool that the solution can use devices buried in the parking lot to find open spaces and GPS to help you find a good one. But honestly, we don't have trouble parking at Best Buy nearly as often as we have problems due to a lack of ubiquitous visual collaboration. On the other hand, the demo did show the ability for in-store staff to quickly connect customers, face to face, with the exact right expert at each point in the sales process. That kind of future vision has powerful potential. (The joke of the event was that the bright colors on his shirt caused the venue's video cameras to have flare problems - red flare...white flare...silver flare...) Microsoft's demo showed Lync video actually working on an android and iOS smartphone in real time. The video was choppy and unstable, but those in the audience were excited to see it finally work after so many promises. He did say that Lync-Skype integration was not ready to show yet - that audio would probably be in June and video \"sometime thereafter.\" It makes it very difficult to analyze and compare Lync when you always have to preface it with a debate around the analysis being based on the available product today vs. the promise of the product of tomorrow...or next week...or next month. He then showed one of the new Lync Room Systems in action. Co-author David Danto was honored to be selected as a panelist for the \"Managed Video - What's Next\" session. In discussing Managed Video Services David pointed out that a fundamental change is coming in the industry and in client expectations around a services partner. The model that's been in use - dating back to managing PictureTel Concorde systems on carts is log dead. Video Managed Services need to include responsibilities for the network, desktop, warranties, dynamic licenses - essentially now becoming end-to-end Collaboration Managed Services - with no \"handoff to the IT guys\" as we ARE the IT guys. Expect many changes in the landscape in the coming months - including new manufacturers, new collaboration modalities and new Managed Services models.